This International Volunteers Day (5 December 2018), Norwood shines a spotlight on their incredible team of amazing volunteers for the contribution they make to Norwood across every aspect of the charity. Each and every year Norwood relies on over 1,500 volunteers who give their time regularly to support the charity’s work. Hundreds more support events and fundraising activities. Few organisations could feel prouder of their volunteers than Norwood. Here the charity shares just two of the special people who give up their time and energy to support their vital work. Meet Lesley. Lesley has been bringing style with a smile into Norwood’s Stanmore charity shop since 2014. Lesley, an educator who specialises in teaching personal, social, health education (PSHE), began her journey with Norwood when she donated clothes to the Stanmore charity shop many years ago. When Lesley’s mother passed away, she wanted her fabulous clothes to go to charity. While researching for the perfect place to pass the clothes on to, she discovered Norwood charity shops. After phoning to enquire, the shop manager took it upon herself to go and collect the clothes in person, and when she did, they had a lovely conversation that Lesley says still warms her heart now. The clothes took the prime position in the Norwood shop window and, of course, got snapped up within days. So when Lesley was looking to do some voluntary work, she automatically thought of Norwood. As well as working in the shop, Lesley was put forward for Project Faith, where she worked alongside Muslim women in a wonderful, multicultural, interfaith project. This sort of volunteering is important to Lesley and she hopes to do more interfaith work through Norwood in the future. Lesley is a fantastic example of what Norwood volunteers are all about. She is a much-loved member of the team and will always go the extra mile. If you go to Norwood’s Stanmore shop on a Friday, you’ll know when you are greeted by Lesley. She is passionate about Norwood and will go above and beyond for every customer. You are also guaranteed a good chat …and let’s face it, that’s a big part of the shopping experience. Meet Simone. Simone volunteers at Norwood’s Stanmore head office, helping in the Volunteering, Data and Recruitment teams. With two children moved out of the family home and her youngest off at university, Simone decided it was time to put her energy into something worthwhile, and that’s where Norwood came in. Since joining Norwood, Simone has loved every minute. Not only has it been rewarding, but she has also learned new skills and met some great people. The flexibility of volunteering has helped Simone massively as she is able to fit it in around other commitments which, as we all know, can seem never ending. 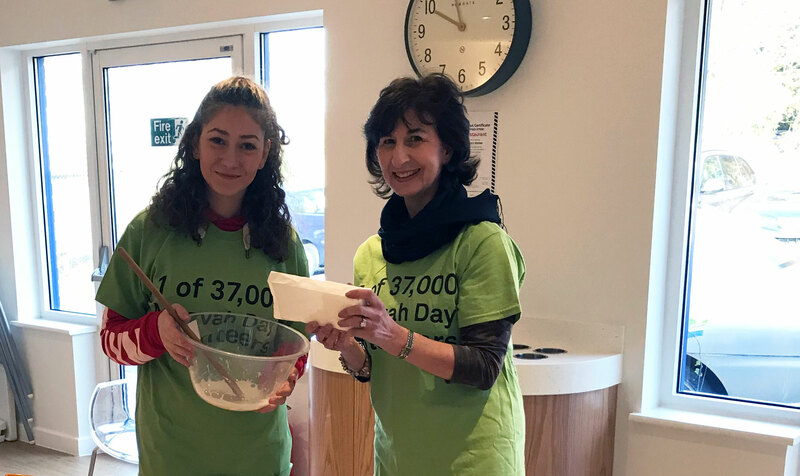 Simone is always putting herself forward to support Norwood in new ways, helping at Norwood’s Mitzvah Day celebrations and Shavuot ‘Cheesecake and Chat’ event held at the Kennedy Leigh Family Centre, to name a couple. Both of these events were huge successes, largely thanks to volunteers like Simone, who give up their time to help others. At the end of June, she also helped at Norwood’s Property Lunch – the second biggest fundraising event in the charity’s events calendar. Jennie Wharram, Head of Volunteering and Trading, said: “Without our wonderful volunteers, we simply couldn’t provide the quality of services that we are able to offer every year to thousands of vulnerable children and their families, children with special educational needs, and adults with learning disabilities and autism. Norwood is the largest Jewish charity in the UK supporting vulnerable children and their families, children with special educational needs and people with learning disabilities and autism. Norwood supports over 4,000 people every year, giving them the tools they need to live the most fulfilling lives they can. Norwood works with 56 local authorities, delivering wide-ranging services in a variety of residential accommodation and supported living services, short-break facilities and family centres across London and the South East. Through a workforce of over 2,500 – made up of 1,250 staff and 1,500 volunteers – we provide the highest-quality care to transform the lives of children and their families, and vulnerable adults. It costs £34m a year to deliver Norwood’s services, £12m of which must be raised from voluntary donations. Norwood relies on around 1500 volunteers who give their time regularly to support our work. Hundreds more support our events and fundraising activities. People choose to volunteer for Norwood for so many reasons, but they all have one thing in common: an understanding of how important it is to support our work in their communities. There are many ways that you can help support Norwood’s work too. Whatever your skills or interests, we are bound to have something you will enjoy doing. To apply to be a volunteer, then please call our Volunteering team on 020 8420 6926 or email volunteering@norwood.org.uk.